TL;DR: Simple string validation code for ASCII characters can be massively faster than Regular Expressions based approaches. Jump tables represent a technique with amazing speed characteristics for string validations in particular and similar problem patterns. When optimizing performance, always include a wide range of sample data to cover best and worst case scenarios! Two days ago, I read an interesting blog post by Maarten Balliauw on "Making string validation faster by not using a regular expression". The article caught my interest just because it was about performance and that's what generally gets me - waaaay too easily! Anyway, Maarten's blog post finally made me decide to start my own blog (thanks, Maarten!). So you are just looking at my very first blog post. The bottom line of Maarten's blog post was roughly this: While regular expressions quite often seem like an obvious choice and the Swiss army knife for anything that's to do with strings, sometimes it pays off quite nicely on the performance side to handcraft a certain routine using plain honest (readable even!) C# code - so ignoring the potential beauty and suspected benefits of any specialized frameworks. Now, this code is already way faster than the RegEx based version. But is there anything else hiding that could be optimized? And it turns out: There is. - Is our ASCII value >= 48 (check #1) and at the same time <= 57 (check #2)? No. --> Next check! - Is our ASCII value >= 65 (check #3) and at the same time <= 90 (check #4)? No. --> Next check! - Is our ASCII value >= 97 (check #5) and at the same time <= 122 (check #6)? No. --> Next check! - Is our ASCII value value[i] == '@' (check #7)? No. --> Next check! - Is our ASCII value value[i] == '/' (check #8)? No. --> Next check! - Is our ASCII value value[i] == '.' (check #9)? No. --> Next check! - Is our ASCII value value[i] == '_' (check #10)? No. --> Next check! - Is our ASCII value value[i] == '-' (check #11)? Err. Yes. Hooray! Phew, we got a valid character. Let's check the next one! Needless to say that this gets worse the more checks we need to perform. What if we had more allowed special character? What if only some very specific non-continuous set of characters was allowed instead of the pleasantly wide sets A-Z and a-z which we can use range checks on? So how can we improve all of that? A looong time ago, some utterly nifty guys came up with the concept of "jump tables". The basic idea here boils down to translating some input value (the "value under test") into an offset that maps directly into a small precomputed array (aka "to a location in memory") where we find the answer to all our problems. This technique is something that e.g. most compilers use in order to optimize certain cases of switch statements. You can read more on that topic here, here or here. Sounds confusing? It's easy. Let's go! Some background information (skip this if you're short of time) that we might want to understand first before we go ahead is something just as ancient as jump tables: the good ol' ASCII table. .NET uses UTF-16 to store strings internally. Luckily for us, though, the first 128 code points of UTF-16 are identical with the first part of the ASCII table (read and read) and we are looking for characters in the ASCII range only. So that's convenient because we do not need to descend into the crazy lands of Unicode. All we need to know is ASCII. Also, we are not making an oversimplification here since the original check in Maarten's blog post was using RegEx character ranges [A-Za-z] which again only check for plain ASCII characters without umlauts, accents or any other fancy stuff. Right. Where were we? Ah. The cost of this is a little bit of memory on the heap (read) which is 123*sizeof(bool)=123 bytes - that should not cause us too much of a headache. Also, we run the initialization code only once per AppDomain during the static initialization phase so we get implicit thread-safety (read). Nice! //    which will immediately tell us if the char is allowed or not. And that's it, really. Still short and concise enough for my liking. - the actual jump table check. We can now throw any number of arbitrary characters into our filter and the algorithm will still work at the same speed. Also, performance now only depends on the input length, string characteristics do not play a role anymore. Nothing fancy or surprising here. The exact same algorithm as above - simply rewritten to use a pointer. Depending on the concrete usage scenario of this method, we could optimize it even further by splitting it into two parts the way Sergey Teplyakov describes here. But that would require real world sample data and loads of additional test runs. - Jump tables provide a neat way of speeding up things where we can precalculate check results for a small range of candidates. - When optimizing for performance, we need to always make sure to include a wide range of test candidates in order to cover the best, average and worst case scenarios. - Unsafe code generally rocks when it comes to performance. It's not as easily digestible. But once you start micro-optimizing, oh well, you should be able to quickly grasp a short block of unsafe code like the above. 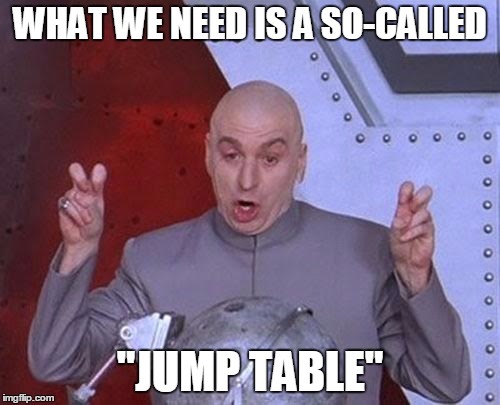 Anyhoo, my next post might shed some more light on the the topic of jump tables and there's more in the pipeline so stay tuned. great article! And good style too. Although I believe it should be 123*sizeof(bool), not sizeof(char).